As part of the ongoing prep for next year's big trip I've been trying to decide on the best way to extend the range of the 90. 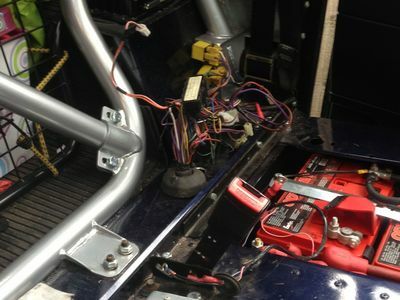 I've already fitted a secondary tank to the main fuel tank but given the stupid money that people are asking for additional tanks to get relatively small increases in capacity I decide the simplest way is to fit a standard 90 fuel tank under the driver's seat. 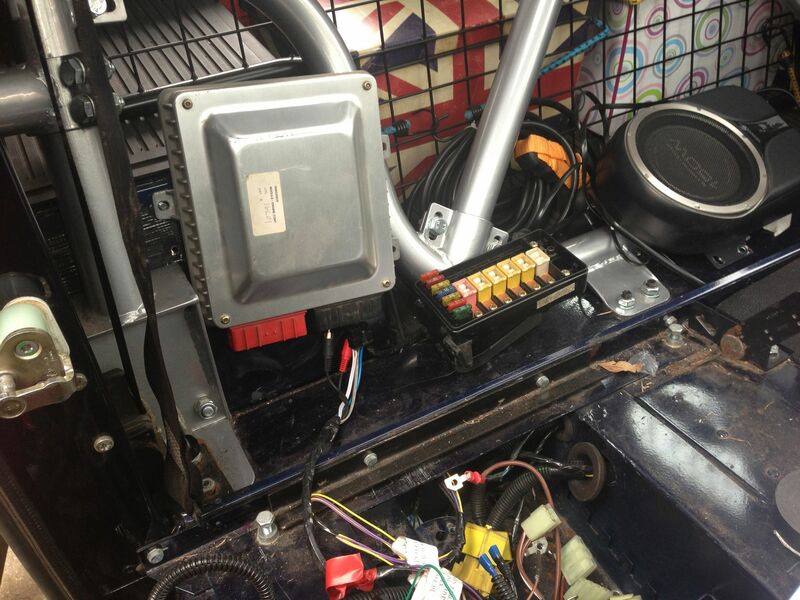 The only real problem with that is that, being a TD5, there is a box under the driver's seat that contains most of the vehicle's electrics with the main fuse box, engine ECU and auto gearbox ECU. This weekend I started the job, it's taken longer than expected (doesn't it always) but I've made some real progress and it might be useful for anyone else thinking of moving the ECU for waterproofing. First job was to figure out where and how the ECU and fuse box could be located. I could then see if the looms would reach or need extending. 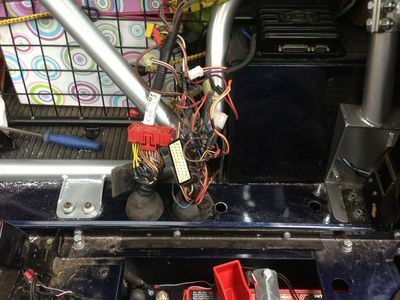 After deciding it might work behind the driver's seat there was no way either of the two looms would reach so both would need extending - I'd assumed I might have to extend them anyway but the looms are both routed down the nearside of the gearbox and then cross over to the off side. After removing the looms from the seat box and experimenting a bit it seemed that, whilst they wouldn't reach behind the driver's seat they would reach behind the passenger's seat. 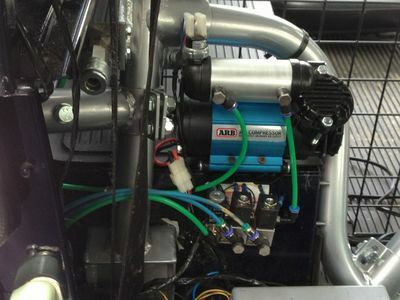 On Pam's 90 that complicated things a bit as the ARB compressor and an auxiliary fuse box were already mounted behind the passenger's seat. So relocating the engine ECU had to start with relocating the aux fuse box and compressor. Last edited by davew on Tue Mar 05, 2013 7:55 pm, edited 1 time in total. 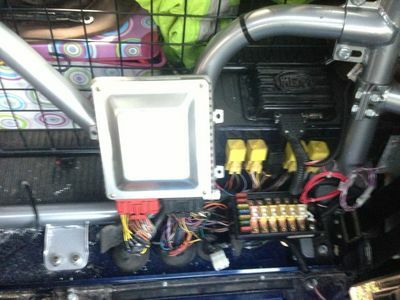 The point of no return was drilling out the 70mm hole for the bulkhead loom as that needed to go the furthest and determined where the ECU could be positioned - on later TD5s the two looms use different sized holes so it's worth double checking you get them the right way round to match the ECU ! First hole drilled and the cable in place... this is about as far across as you can go without cutting a lump out of the battery box. Last edited by davew on Tue Mar 05, 2013 7:56 pm, edited 1 time in total. I cut up an old bulkhead fuse box panel to get the "comb" to mount the relays on the front of the wheel arch. 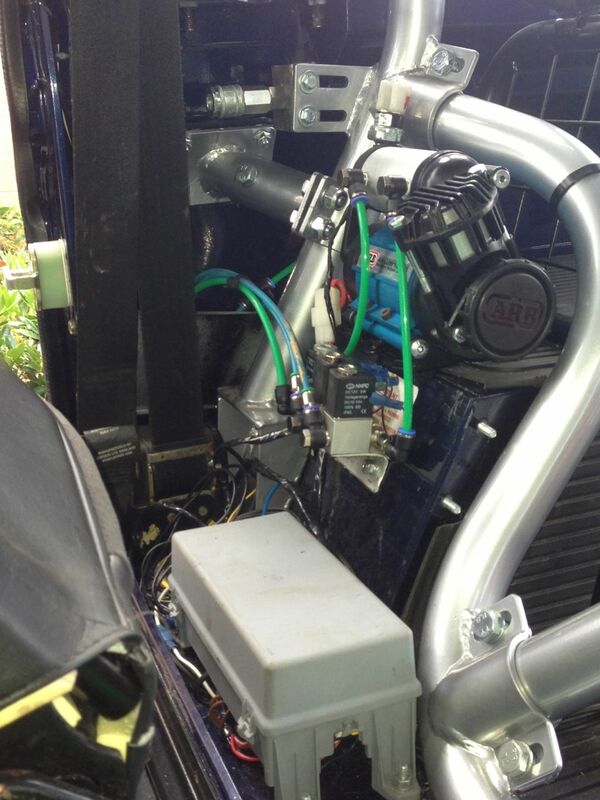 The Compushift (gearbox ECU) sits nicely in the space on top of the wheel arch. Last edited by davew on Tue Mar 05, 2013 7:58 pm, edited 2 times in total. Final assembly, I took the opportunity to tidy up the gearbox wiring while I was at it. 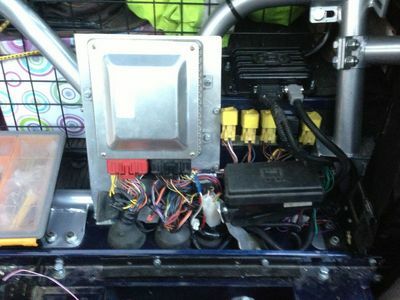 It would have been far simpler on a vehicle with a bulkhead ! Just need to rewire the auxiliary fuse box and the compressor behind the driver's seat now ! 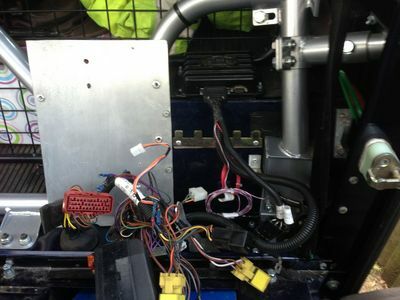 are you planning on putitng any rubber tabs/pads under the mounting plates to reduce vibrations and possible damage to the ecu when driving for hours on washboad roads? Not planned on rubber mounting it, the problem with rubber mounting is that without some form of test system there's always a danger that you can make things worse, particularly with high frequency vibration. By trying to reduce a problem you can easily make it worse by accidentally hitting a frequency that causes the ECU to oscillate on it's rubber mount. I've not heard of it being a problem with the standard setup and there are, relatively speaking, a lot of TD5s in Australia. Rear axle now has Ashcroft shafts and an ARB locker, front is ready to fit but it'll wait until after the Muddy Truckers.